"How to express hybridGEOTABS in the ALDREN Evaluation Scheme?" 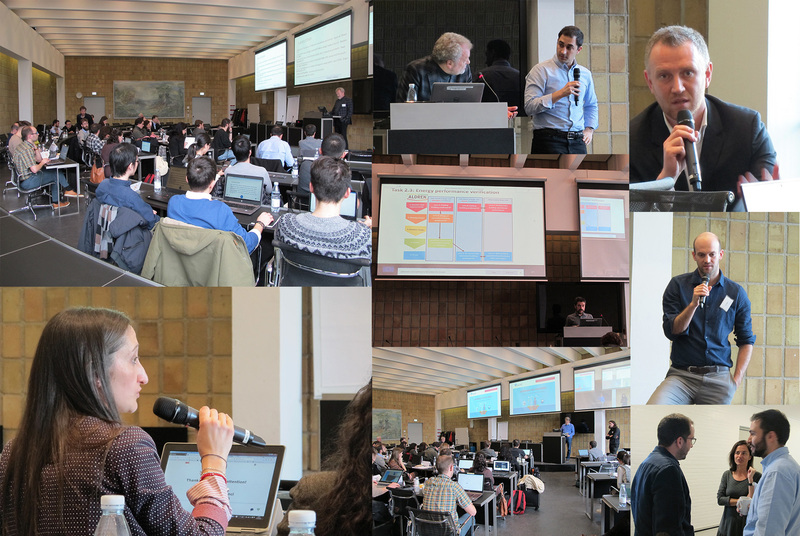 The joint workshop was held on March 27, 2019 at the Technical University of Denmark (DTU), Kongens Lyngby. During the morning, a working session was held between ALDREN and hybridGEOTABS to exchange experiences and knowledge amongst the partners in order to explore potential working practices between both projects. Discussions led to the potential of applying the ALDREN methodology in at least one of the pilots of the hybridGEOTABS' project. During the afternoon the workshop was open to the public attended by about 65 people (approximately 40 in person and 25 via webinar). The full video of the workshop can be viewed here Below is the order of all the presentations, along with links to the pdf presentations: The ALDREN procedure presentations: Introduction to ALDREN – Mathieu Rivallain, CSTB EVCS ratings - Jana Bendžalová, ENBEE Energy Performance Verification - Robert Cohen, Verco Indoor Environmental Quality (IEQ), Productivity and Health - Pawel Wargocki, DTU Financial Performance - Yona Kamelgarn, Certivea ALDREN Building Renovation Passport & Renovation Strategies - Marta Maria Sesena, PoliMI hybridGEOTABS - Radiant Heating & Cooling, IEQ, Health Productivity and Comfort presentations: The history of TABS and its worldwide applications - Bjarne W. Olesen, DTU How to design a hybridGEOTABS building? (state-of-the-art) - Wim Boydens & Jelle Laverge, UGent Innovative controls in hybridGEOTABS: MPC concept and first results - Jiri Cigler, Energoklastr Indoor Environmental Quality Productivity and Health – Pawel Wargocki, DTU Innovations in radiant heating and cooling systems: use of PCM - Ongun B. Kazanci, DTU The session ended with a live poll among attendees who belonged, mostly, to the field of research. Results are be provided here A further Questions and Answers session at the end of the workshop is below, providing some more insight into both projects: ALDREN Q&As Is there a definition of the Nearly or Net-Zero Energy Building (NZEB) at the EU level or only at the National levels? Jana Bendžalová: ALDREN has its definition of Nearly Zero Energy building (NZEB) in class A. The value is not necessarily fully in line with the national definition commissioned by member states because of many differences in calculation methodologies, indicators (e.g. total or non-renewable primary energy), floor area, primary energy factors, export of produced energy from RES etc. The definition is tested on model buildings with the national input values for thermal envelope and systems properties. The definition of ALDREN NZEB for office buildings in term of non-renewable primary energy use is close to the Commission recommendation (EU) 2016/1318 on guidelines for the promotion of nearly zero-energy buildings and best practices. Robert Cohen: Just a quick comment that the European Green Building Councils are also defining zero-energy buildings for the World Green Building Council, so there are national definitions being developed at the moment. The Dutch Green Building Council has come up with a definition called the Paris Proof concepts, which is really interesting. Should the renovation passport use or integrate BIM? Marta Maria Sesana: For sure within the ALDREN procedure we are going to investigate this aspect. One module of the ALDREN BuildLog is title and structured to collect Documentation and BIM. It's definitely another big issue to investigate, and the desire of ALDREN is to go on that path. It was presented that the building passport should be taken with the building for it's lifetime. How do you envisage who will manage this - who are the actors during this process, and what are their roles? Marta Maria Sesana: When we started to structure the data model of the ALDREN Building Renovation Passport in detail, we were aware on the need to keep in mind that along the path there are different 'actors' and their knowledge, background and expertise are not the same. For that reason we have structured it with different Level of Information (LoI) or let’s say Level of Detail (LoD) to not lose data quality, but at the same time to reach different target people. People trained by the ALDREN approach should fill in the ALDREN BRP and for them we are preparing dedicated training material and the pilots will be the first real application of the approach. LoD will support a better comprehension for different actors. For that reason we are also looking at a lightversion, I mean a more friendly version, with few but comprehensible indicators or clear rating even for the building owner or user. Some building passport initiatives already exist, but they are focused on residential buildings, so ALDREN will be the reply for the non-residential ones. In all LoI, the different actors need to understand what exact data they are referring to; which indicators or which energy they should consider, which renovation strategy, and when they should apply it and so on. The importance of a common language and the data quality will be the key to have a user friendly and comprehensible tool to trigger renovation. Along the ALDREN approach, users can give feedback for example, but they wouldn't be the person who updates the passport/logs. Mathieu Rivallain: We can also slightly reposition this question in line with what we do with EPCs. This passport is not the only item of building documentation that is supposed to be revised over time and performed, for example, every 10-years because it has a certain validity. In line with EPCs, we could figure out that EPC assessors could be responsible for updating the building information and building documentation, at least with respect to some topics. Related to energy ratings, this is quite direct. The inclusion of health and wellbeing parameters, depending on how far we go, could also be introduced in this vision. The question of meeting the targets between predicted and actual performance is maybe to be dealt slightly differently, because this issue is to be considered when we renovate the building. If we just exploit the building without a renovation programme or plan, maybe the strategy could be slightly different. Some companies offer their services to perform this analysis along with the deep renovation process. Depending on the topic, perhaps the professionals to be involved can be different, but not yet totally conclusive. Robert Cohen: I was at a very large meeting of financial investors who are interested in the building passport, not really for understanding the energy situation in a building, but to understand the investment potential for the property. If they have this data digitally they can play this financially, and that is also why there is a lot of interest in the building passport. hybridGEOTABS Q&As How do you deal with the fresh air and ventilation in hybridGEOTABS? (There is a system that uses the slab to condition fresh air, is that considered?) Bjarne W. Olesen: We don't use that, but there's always a ventilation system, and often when building with TABS this is used as a secondary system to provide some cooling or heating, and if you need dehumidification. In that case it works as the secondary heating/cooling system. In othercases there may be another secondary heating system, but often it's the air system, which you have for the ventilation that's being used. But to use air to heat or cool the slabs - we know it was first introduced in Sweden many years ago, and there is a company promoting it in the UK. The difference here is energy is still carried in the air, but we want to carry so much of the energy as possible in the water, because it is more energy efficient. Plus, there has also been discussion about how clean are the channels in the concrete are, and what are the risks for bad air quality and so on. I was very interested by the phase-changing materials being connected to Photovoltaics, especially in the night? Ongun B. Kazanci: The main idea is that we have the PCM panels in the room, removing heat from the room, so you need to get rid of that heat somehow. The photovoltaic and thermal panels (PVT) are on the roof, and normally you would install for electricity, and if you have the 'T' (thermal) you can also get some heat out if it, but you can also use them for cooling if you circulate water through them, radiating heat to the sky. We have some storage tanks in between, so they are not connected directly to the PCM panels. Are the phase-change material panels already commercialised or not? Ongun B. Kazanci: The ones we showed are the ones we are testing are the only panels that exist, and not commercialised. So we took what was existing, tried to combine them, but found they weren't optimal for our purposes, so took a lot of time and testing. Bjarne W. Olesen: There are some other panels on the market; the first one we used was a commercial product that was able to buffer humidity. What about using gypsum panels? Bjarne W. Olesen: But, is there piping in them? We are only talking about those that you can activate with piping. The problem with PCM is that you can use them as passive, and maybe use night air cooling to generate or make them solid again, but the heat conductivity is so bad, you need to have a very good connection where you want to remove / supply heat. The only point was that there are gypsum panels already available and whether it is simple to just integrate some pipes? Bjarne W. Olesen: We did look at that because we took one of those gypsum boards and just had a standard suspended metal radiant panel. We thought the easy way is to take existing products. So we took 1.5-2cm gypsum panels, and made a good contact with the metal surface of the radiant panel, but it didn't work that well because of the heat conductivity. So the best way is to have the pipes within the panel. Ongun B. Kazanci: We want something that we can control, within a panel as it's not just increasing thermal inertia/mass in the room, but have something that we can do more with. There have also been some ideas to increase conductivity by using graphite in the construction, but the prices just go up, and it becomes very expensive. Who is going to sell the MPC solution that you are developing and how it will be packaged, and by which partner? How will you do this market uptake after the project? Jiri Cigler: Energoklastr or the new start-up company set up by Filip Jorissen - TACO are partners who intend to take this up. In the end a very good business plan would be for, in the case of new buildings, to design and build the building by one company who develops the model that can also be used for the validation of the design, and then this model can be used directly in the MPC. This makes sense as there are big savings in this development in cost and commissioning, as it doesn't take 2 years to commission TABS system, but 1-2 months to set up all communications and then it should work. Eline Himpe: We are working on a business plan within the project and there will be more outcome during the coming year. What do you know about the cost effectiveness of MPC and PCM, depending on current the state of the building, if it is already an energy efficient building? These savings are very well evaluated using heating degree base data and so on, but in this case there is no benefit of MPC for example on the heat pump efficiency. With GEOTABS buildings, the lower the peak load, the better the COP, would increase the potential of MPC much higher than the 23% improvement. There have been comparison between RBC and MPC in the case of hybridGEOTABS buildings and the savings have been higher than 50%. Bjarne W. Olesen: For some of the bigger markets, they would implement it. Also for the need for continuous maintenance of a system, which you can combine with MPC. So I certainly think there is a market for it.